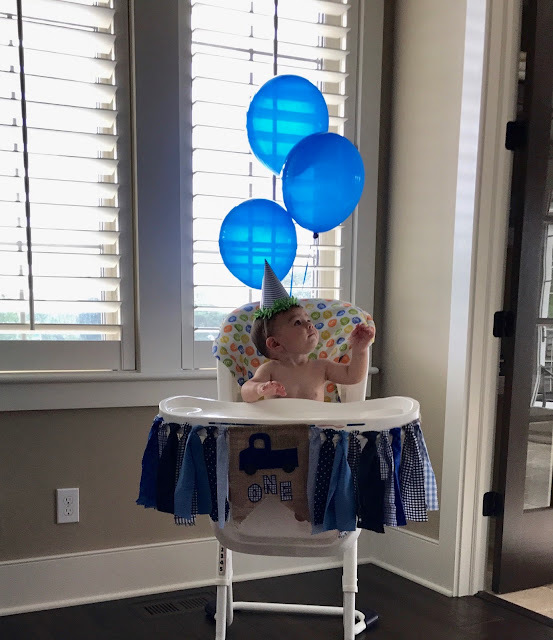 KEEP CALM AND CARRY ON: Grayson's First Birthday Party! 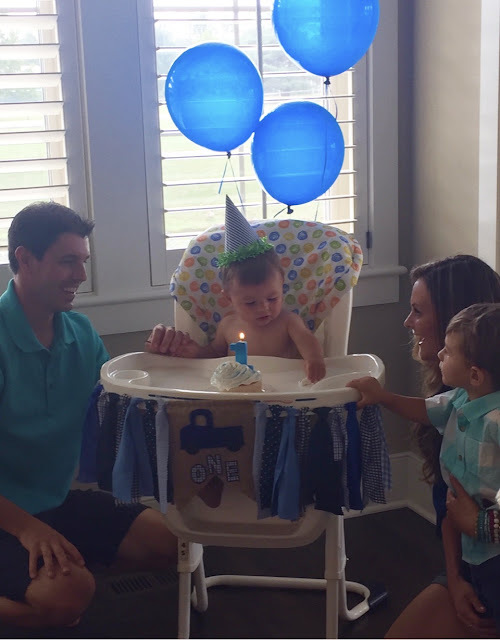 Finally getting a chance to post Grayson's birthday party recap! 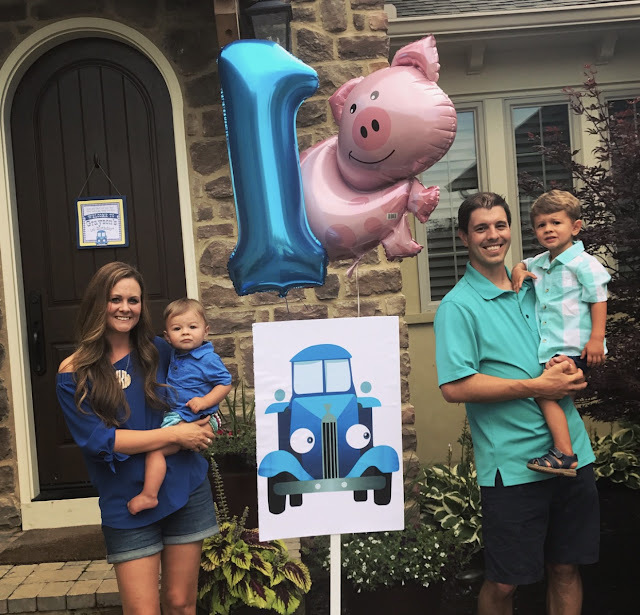 As for the food for the party, I wanted it to coordinate with the truck and farm animal theme from the book so we had pulled pork sandwiches, garden veggies, farm fresh eggs, little piggies (pigs in a blanket), chicken feed (popcorn), baked beans, and diesel fuel (lemonade in a big pitcher.) My stepmom went completely above and beyond with the awesome truck birthday cake and farm animal cupcakes!! I was blown away by cute they were and how good of a job she did on them! My favorite decoration was his highchair birthday banner. I got it from this shop (the owner does a ton of different themes or other colors) and it is even cuter in person! 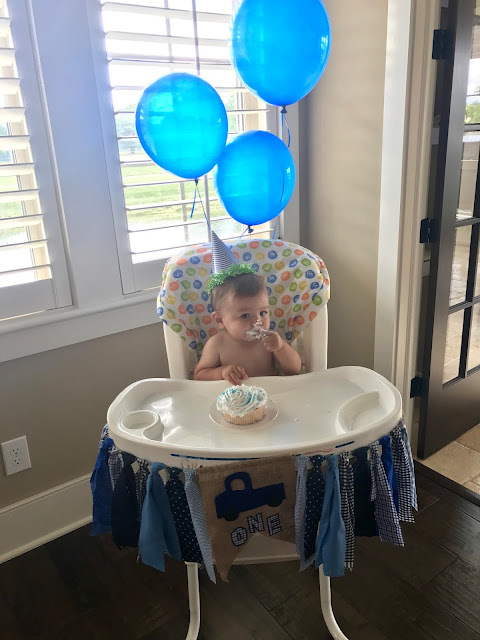 It was such a fun party celebrating our little man, and I'm already looking forward to what next years party will include! Pig Balloon // #1 Balloon // Truck Poster (printable) // Wood Crates are from Michaels // Gingham tablecloth I found at the Dollar Store // Grayson's birthday shorts I found at a local boutique, top is from Old Navy!